Veterans ride down Second Avenue in remembrance of the sacrifices of Vietnam War veterans in 2016. 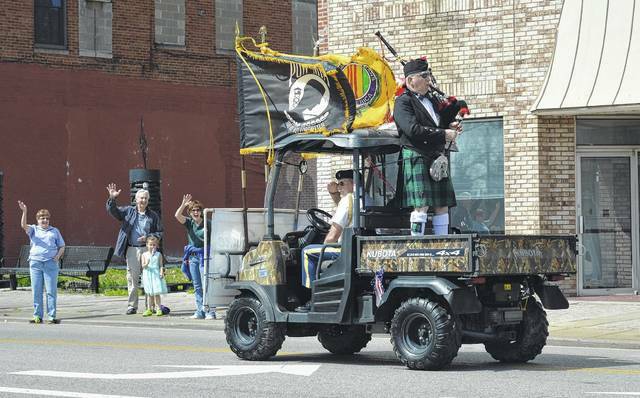 GALLIPOLIS — Veterans of Foreign Wars Post 4464, American Legion Post 27 and the Gallia County Vietnam Veterans of America will be hosting a parade this Friday in remembrance of National Vietnam Veterans Recognition Day. The date of the event coincides with events to commemorate 53 years after the Vietnam War. Line-up for the event will begin at noon at Duke Cleaners. The parade will proceed down Second Avenue. A lunch will be hosted at the VFW post on Third Avenue after and is open to the public. According to VFW Post Commander Bill Mangus, when many Vietnam veterans returned home, they were not celebrated like previous veterans that had fought in World War II or the Korean War. Mangus told the Tribune he remembered veterans coming home and being spit on after having endured traumatic human experiences, watching comrades and friends pass in explosions or gunfire. Many veterans did not return home to parades, only spite. Because of this and because of the commemoration of Recognition Day, veterans felt it necessary to conduct a parade ceremony. According to the Department of Veterans Affairs, 9 million Americans saw active duty in the U.S. Armed Forces during the time of the Vietnam War. Somewhere around 7 million are still living. According to thevietnamewar.info, around 58,000 estimated American military personnel were lost in the conflict. Roughly 47,000 of those were lost in combat and nearly 11,000 died of other causes.